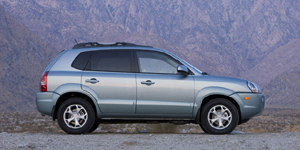 For 2009, the Hyundai Tucson receives very minor revisions to the front grille and rear fascia, as well as a new 16-inch wheel design and metalgrain interior accents. Heated front seats and windshield wiper de-icer are standard on SE 4WD models, while a power tilting and sliding sunroof is standard on Limited V6 models. Find the used Hyundai Tucson of your choice from a dealer in your area. Search our used car listings now.